Hey everyone, just wanted to know if anyone knew any great ways of displaying minifigs? I'm primarily a minifig collector, and I have few bricks beyond the constructed sets I display around the house. 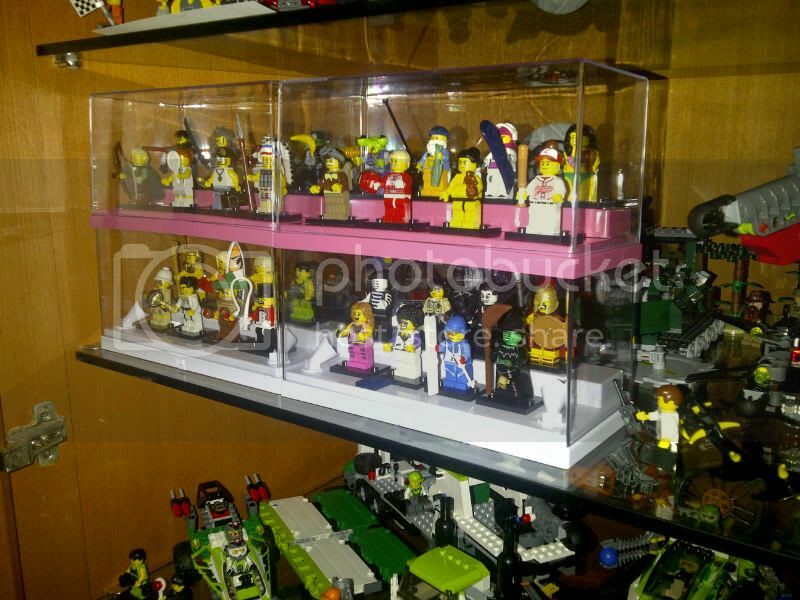 Currently my minifigs are stored in compartmentalised boxes designed for construction work, but does anyone know any proper display cases I could buy or find on the web? Simply Bricks in the UK have some great cases. Check them out on Bricklink (this discussion may need to move to Marketplace if we're making recommendations). edit: Their store is closed at the moment. You'll need to check back after the weekend. ^ and even a review of the perspex minifig prisons, sorry - 'display cases'- from Huw ! I have 40 of them on order, and will hopefully take delivery this weekend. Can't wait ! I use these http://www.minifigforlife.com/theprostore/main.php?P=product&amp;pid=D000004&amp;T=8 x 5 Minifig Display Case not cheap, but good quality and can be stood up or wall hung. ^^ I'm sure I ordered mine after you DrD, and I received mine ages ago! ^ I'm picking mine up in person. I use an old type set box, which has different size compartments for the mini-figs with taller extras, like the fisherman....and it hangs great on the wall. I only have 3 minifigs at the moment so I'm not really displaying anything right now. But how about making a minifig display rack in Polyurethane or polystyrene? If I'm not mistaken it's the stuff architects use to make maquettes... You would have to be a bit handy I suppose but it's cheap and durable. 3mm thickness would suffice, a piece of 70 by 100cm costs less than $10 and allows you to make about 45 cells of 6dots wide x 6dots deep x 8dots high. Thanks for all the good ideas everyone! I shall look into some proper storage shelves whenever I can. Dad bought me some things from repco a while ago that are ment to store nails or washers or something but that does me just fine. it's double sided so I have my minifigs on one side and my accessories on the other side. My thoughts exactly... I have a lot of yellow minifigs which I keep sorted and boxed, but I also have a lot of fleshies that I display... if every one of us was to combine our minfig collection, we could RULE THE WORLD...! I have displayed my Star Wars figures but they get a little dusty. Also, I must congratulate you for having THREE Jango Fetts... I have only one - a second Jango would bankrupt me! I started in 1999, with The Phantom Menace, but my logic was (and still is) to only buy a set once...! Unbelievable!...Do you keep all this in one room? I really must go through my small collection and try and organise them better. mine are all over the house.....some in the spare room in the loft, some in our bedroom (top of wardrobe and under bed) and some in both my son's bedrooms. 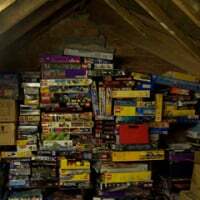 Think i'll knock up some shelving in the spare room to stack the boxes without putting too much pressure on the boxes below. My collection of box items are spread between the loft and two small rooms. I have a storage container for the 2000Kg of loose colour sorted bricks. The stuff on my flickr account is kind of sorted but the loft is a real mess. I need to get up there and sort. Your right it is a pain the built model can not be stored in its original box this would sort out some of my storage issues. I'm just starting to collect and have about 300 diff. I don't intend to display so I just bought a ton of 2x3 ziplock baggies and put 1 in each. Then I put a label sticker on each with the catalog #. please note: these are not my auctions, or those of any person I know, just found them whilst browsing so thought I'd share with you all! 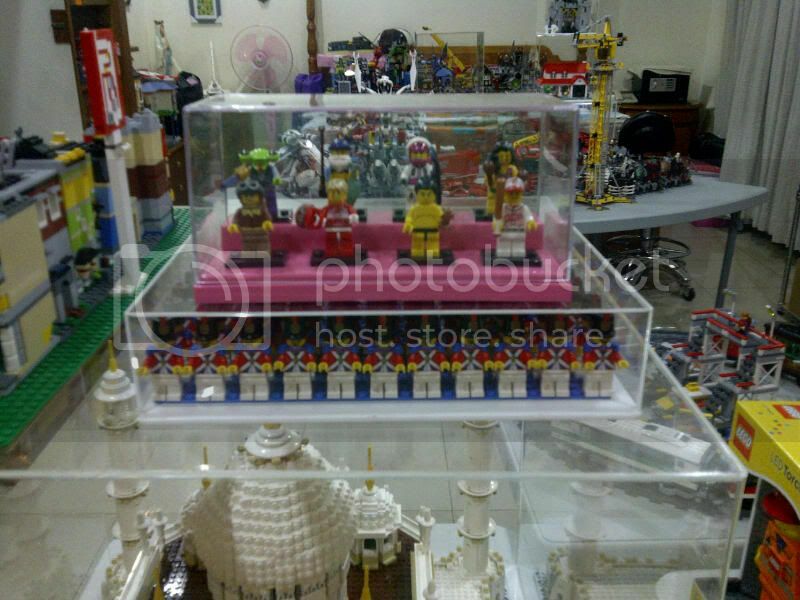 @ elsielontoh: NICE lego room btw! If you have even a few bricks, grab some smallish (maybe 16x6) baseplates and build little backdrops, then stick thematically linked batches of minifigs on the baseplate in front of it. Those shouldn't take up too much space, and might be something you can put together with stuff you already have. Ok, for all who use the case thing, what do you do wheen you have like 1000 figs? Doesn't that take up a lot of room???? @otter. I don't really know how many sets I have purchased. I started seriously collecting the Star Wars sets around 5 years ago, these I tend to buy mint sealed box and never open. The loose figures display I have acquired over the last 10 years with random looses sets and general bulk Lego finds. Going back 5-6 years Star Wars Lego was cheaper you could regularly grab a bargain on Ebay , My limit used to be £5.00 a Kilo back then, but the price has steadily crept up and now you lucky to get it for under £10.00. Bluefox1966: do you also sell some mini-figures? You got a few that I would like to own. I'd been using Bluemoose's technique too (above), but yesterday I discovered a new shape of really useful box has been released, which is the perfect size to fit a baseplate full of minifigs .. no dust, no hassle building anything, infinitely stackable, perfect! ^ I use something similar, but the 4L boxes. The interior dimensions is about the same as an A4 ream of paper, so plenty of room for figures to stand on plates/bases. You can also get different coloured ones, so good for storage of different things in each type. 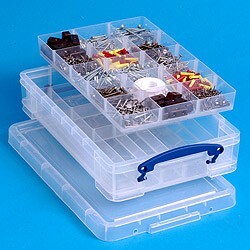 They also do tray inserts for the 4L boxes, which is ideal for sorting parts. ^ Yes, those are great, I use the ones 2x the height of that for pretty much all my loose bricks. Very adaptable as the colelction changes shape etc. ^^ It fits a 32x32 not a 48x48 ..
(I know it could be a bit tighter, but to be honest I wouldn't want it to be, as it would be too hard to get in and out with one hand holding each side). Up until a few days ago I had the majority of my SW minifigs (around 400 now) displayed on a couple of bley 48x48 baseplates in the LEGO room. I decided that dust was going to start becoming a pain and thus for now, I have purchased 500 3"x2" ziplock bags. I actually quite enjoyed putting them all away in their little plastic sleeping bags. I still have a few displayed on a smaller base plate as well as the obligatory minifigs under the TV and on my bedside table (I hope I'm not the only one?!). At some point I would like a display case or two on the wall. Before that I now need some suitable tubs for all my plastic encased treasures! ^ That's a good idea/ use of those containers. I wonder if they have anything like that in the US? ^^^Ansel, you're not alone. I have Kobe and Shaq posing together next to the TV. Recently went on a business trip and brought along Vader as a travel companion. I think we're both sick with minifig fever I'm afraid. Where's Patient Zero, @littletoki, at so we can blame her and her beautiful display cases. Patient Zero!??! LOL. You can't blame this on me! Patient zero, @littletoki, does make the gold standard of display cases, to my mind. Sorry guys & gals, but you lost me..... who or what is Patient Zero? Patient Zero is the first person with the 'Affliction', in this case its for minifig-fever. If you feel any symptoms of temptation upon sight of an Exclusive or Promo fig, please a lego specialist immediately. 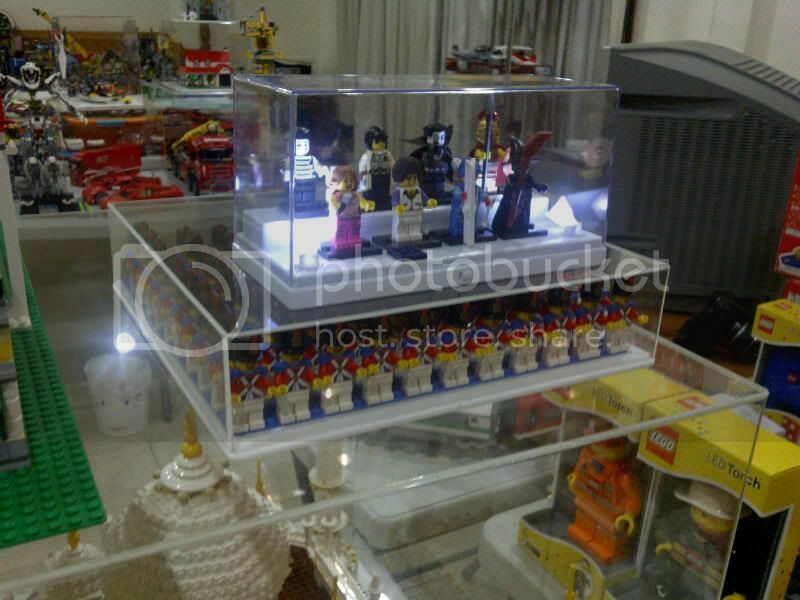 But whatever you do, do NOT open @littletoki's thread of minifig display cases. We believe this is a hotspot for the disease's origins and warning the general AFOL population as such. However, I have been showing early stages of the grab bag virus - but nothing serious yet. @littletoki just messin' with ya, you know we love u and your display cases. I didn't even pay any attention to minifigs until I saw your shadow box. Look at me now, all fig'ed out! @legogeek have you seen toki's take-home from some of those grab bag expeditions? Minifigs out the wazoo. Yes, I have..... and it took awhile to wipe the drool off my keyboard.